The wonderful singer from A Fine Frenzy. As music goes, I’ve talked about A Fine Frenzy as much as any musician, probably more and that’s a lot since I hadn’t heard of them 6 months ago. I started liking as soon as I heard of them (they were opening for a Brandi Carlile concert I had tickets for) and I wanted everyone to know know about them! 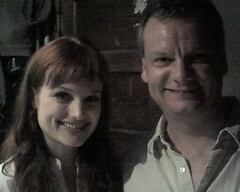 So Alison Sudol is a super sweet person and seems very sincere. She’s got these great songs and wonderful voice. Alison talks between the songs but I think she’d rather just play, because when she plays it’s like she forgets were there (this is a compliment, not a complaint). When I saw Liz Story, a pianist, play a few years back she talked between the songs because “her agent/manager made her” since if not, she’d just play for an hour non-stop; so she’d stop and tell us stories about the song and the song titles. I think of that sometimes when she’s talking, either that or she’s shy when not singing/playing. So I keep thinking of two things she talked about. One was her mother and how much they got along and she really liked her (her Mom was there too, right up front). And the other is that she likes the word “shucks” and she’s thinks people should use it more. “Shucks” And she said something like, ‘I know I’m a nerd’ (but I can’t remember if ‘nerd’ was the actual word). She’s uses Twitter occasionally and the few MySpace e-mails that I’ve gotten from her seem like they were really written by her, that’s got to take a lot of time. I’ve been watching live video from DeLoach winery (in Napa Valley?) watching Kevin Rose, Robert Scoble, Gary Vaynerchuk (wine guy) and Tim Ferris ( The 4 hour work week ). And typing questions and getting answers from the live video! Plus we all got an invite to a wine party tonight, but I didn’t get on a plane and go, I really really should have. I think they’ve gone to several vineyards actually. I’ve also sent comments to Alison Sudol of A Fine Frenzy and gotten responses. I’ve also provided some tech support to a MySpace musician in Kentucky, I’m not yet sure if that solved her problem. Ordered a (probably mismarked) outdoor George Foreman grill that I probably don’t need for $45 shipped. Deal appears dead or I’d link it. And that’s just the out-of-the-ordinary stuff. Alison Sudol was excellent last night. A very small venue at The Shelter, the cancert was sold out but I’d guess there were only about 300 people there, lots of room. No one was back farther than about the equivalent of about 10 rows (no seats, general admission standing only with just a few tables). I’ve seen A Fine Frenzy before and it was a smaller venue so it was great having the small crowd and as a bonus it was a non-smoking show. She’s has such a lovely voice and writes her own songs. She’s got this voice that’s kind of a Sarah McLachlan / Tori Amos voice and she’s just incredible. She so beautiful and has this sunning red head, and while it might not be naturally that red, she’s got that anemic porcelain look that so many red heads do, I’m assuming she’s actually a redhead. My camera in my phone takes pretty crappy pictures, but I tried to take a few. It was a busy night as we had a fund raiser at work at six and the concert doors opened at 6 too (they’re about 25 minutes apart). So we planned to skip the opening act and just see her and depending on the time possibly go back to the auction. When I finally called the concert hall. They said she was going on in 15 minutes!!!!! So I had to find Kelly and Mark get out of there. We made good time, even with having to go a longer route, found free parking right around the corner and when we walked in the music was playing but she hadn’t uttered a word yet!! So it was a great night. Alison did show up at the sales table to sign autographs. So of course, I purchased another copy of the CD. I got her to autograph it, a booklet and I got my picture taken with her (I sure wish I had a better camera than my phone with me, the lighting was pretty poor were we stood). Once again, she was so polite and pleasant with everyone, almost shy like. I hadn’t realized how very beautiful she was until I got that close to her, it made me feel kind of shy at that point. The booklet was interesting about ten 5 inch by 7 inch pages with great photos and an interview. I think they were giving them away (at least I didn’t pay for the ones I grabbed for my friends and I) but they were really nice. They looked like they were from an earlier tour (maybe from some kind of press or info packet).I’ve been so happy with all the ‘opening acts’ that I’ve seen lately I’ve been very happy with most of them and become a fan of many recently. Heck, Brandi opened for Indigo Girls when I saw them a few months ago. I would travel a ways to see AFF again! I was really surprised that Alison didn’t sing a sone with Brandi (or vice-versa). A few odd things – The manager(?) wouldn’t let me take a picture when she was signing photographs, “please wait until she poses” (or something like that). I would have put it with the spot where I was talking about her signing, so that it totally was in context; but it didn’t seem worth it to try an explain it. Someone posts Twitter updates for A Fine Frenzy but they didn’t do any in Detroit, which I was keeping my eyes open for (and since they didn’t have a concert the next day they might have still been around). She was so nice to everyone and signed everything that was put in front of here. I was towards the end of the crowd and she was just wonderful to all of us! I got a CD signed and some kind of booklet they were giving out. I got to shake her hand and of course I got the photo too! 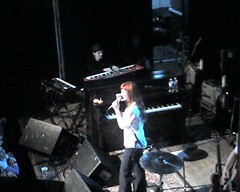 This is Alison Sudol from AFF at St. Andrews Hall. So I’ve mentioned A Fine Frenzy more than a few times lately; they tour with Brandi Carlile and hit Detroit next Sunday (not this Sunday). And I can’t get enough of their album. 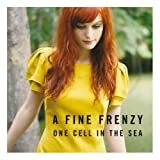 Plus, I’ve specifically mentioned that their 14 track album of One Cell in the Sea was only $7.99 at iTunes (even higher quality DRM-free) or at AmazonMP3. But they sent me an e-mail advertisement stating that it’s temporarily only $5.99 (in the US), for fourteen tracks, that’s a deal so if you considered it before it’s even a better deal now. The ad made it sound like it was a deal for me since I’ve purchased their music before but it looks like it’s that cheap even when I don’t log in. I have no idea when this will last, please let me know if you see that it goes back up. Is anyone going to the Sunday, Oct 14th concert in Detroit? Leave me a message if you are. And if you’ve never been to St. Andrews Hall it’s always way too hot in there so dress accordingly. http://GarySaid.com/tags/alison-sudol/ generated Friday, April 19th 2019 at 2:49:27 pm EDT (in 118 queries in 0.701 seconds).